The recording of today's webinar by Lisa Louise Cooke, "Get the Scoop on Your Ancestors with Newspapers" is now online to view for free for a limited time. GenealogyGem.com's host showed some real newspaper gems, including the newspaper maps and OCR tools in Evernote. You won't want to miss this one! Our live viewers were treated with live webcams from both Geoff and Lisa - another reason to attend live if you can. 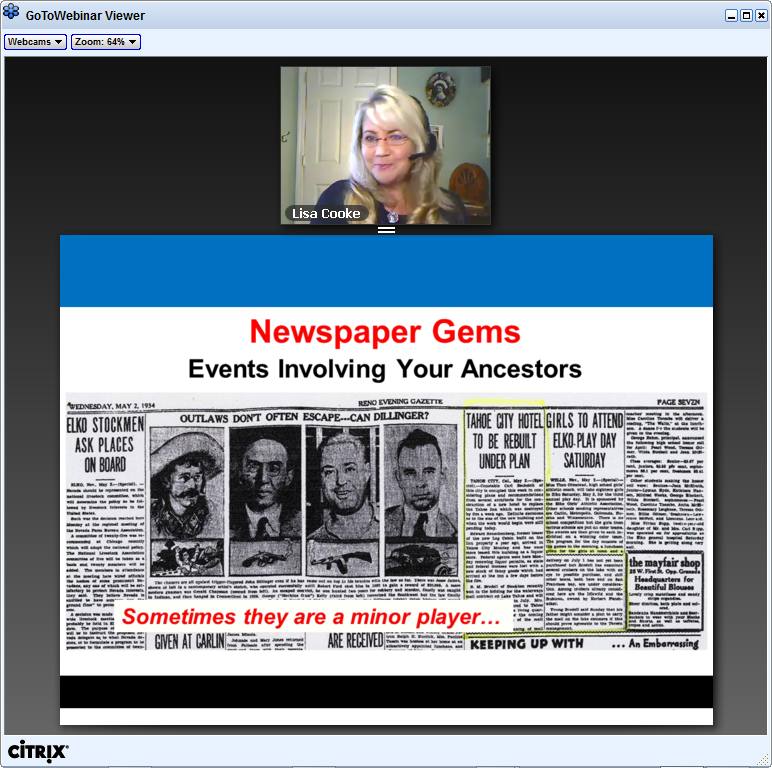 If you could not make it to the live event or just want to watch it again, the 1 hour 23 minute recording of Get the Scoop on Your Ancestors with Newspapers is now available to view in our webinar archives for free through October 24, 2013. It is also available to our monthly or annual Webinar Members for the duration of your membership. Visit www.FamilyTreeWebinars.com to watch. The special discount coupon of news2 that was announced during the webinar is valid for 10% off anything at both www.LegacyFamilyTreeStore.com and www.FamilyTreeWebinars.com through Monday, September 23, 2013. Her 155 page book includes the newspaper worksheet she showed during the webinar. Click here for more information or to purchase.